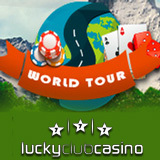 This month we can tour the world with Lucky Club Casino and claim up to $2500 in casino bonuses during the World Tour casino bonuses event now on at Lucky Club Casino. Visit some of the hottest spots around the globe and collecting up to $2500 in bonuses that include hundreds of free spins. Your tour will take you to some of the metro-style casino’s most popular online slots. Begin at lovely Aspen when the winter-sports-themed Wonderland is featured, then depart to exotic Istanbul and the Ancient Wonders slot game. The Silk Caravan will take you to to Beijing before the final stop in Candyland to play the legendary Candyland Cash. Get up to $2500 in bonuses PLUS 200 free spins at Lucky Club Casino. These bonuses are staggered and must be redeemed in consecutive order. All bonuses are valid until June 30th. Lucky Club Casino, which welcomes players from around the world, features dozens of unique games from Nuworks Gaming including Agent Cash. Details about this and other bonus offers are available at: http://www.luckyclub.eu/promotions.